Five possible scenarios after today's referendum in Greece. There has been a sober sense of determination on the streets of Athens this week, culminating on Friday at the Syntagma rally. Four years after the “indignants” occupied the square, an estimated one hundred thousand gathered again to reaffirm their opposition to austerity and authoritarianism. Crowds poured in from the metro shouting “no,” cheering on the government, and frightening a Yes bloc already on edge. The class spread of the vote has become increasingly stark. Elites fear unstable conditions and the sort of confrontation with popular forces they thought could be avoided in the early days of the Syriza administration. The poor feel they have little left to lose, or at least that too much has been lost. And what remains of a firmly professional middle class is recycling an assortment of myths about Russians building bases on Greek isles and assertions that life is better with the Europeans than our Eastern neighbors, even if that life means an extension of policies they know do not work. While reporters are being sent to bombard pensioners in ATM lines, militants are leafletting their neighborhoods, schools, and outside workplaces. Some have gone as early as 5 AM to meet workers as they head into the docks and factories, seeking to fill an urgent void created by political decisions like the Communist Party’s abstention from the vote. Meanwhile, rallies and concerts and television appearances are filling the gap of a more central platform, whose absence remained noticeable amid the Syriza leadership’s various wavering moves earlier last week. This gap reveals two key challenges of the moment. First, the government has the support of the popular classes but has not really been activating potential networks of mobilization these past five months. And second, the leadership insists on maintaining a good euro line despite clear signs of its exhaustion. The toll that months of negotiation and liquidity asphyxiation have taken on Greek society and politics is the basis for which the creditors and domestic capital are aiming to bring the anti-austerity movement to its knees. And the Left is not entirely immune to these attacks. As committed as activists have proven in their efforts over the past week, it is understandably difficult for them to combat, largely on their own, massively funded fearmongering within a week, especially after months of relative demobilization, at least in mass terms. It doesn’t help that significant figures within the party remain hesitant about rupture with the eurozone, even if Syriza’s leader has made arguably irreversible moves in that direction. These battles will only intensify after today. I see five possible scenarios moving forward. The first scenario is that Yes wins and the government steps down. Of course, there is the off chance Greek Prime Minister Alexis Tsipras doesn’t resign and simply signs an agreement with the creditors. Not probable given the steps he’s already taken, but possible. Regardless, either move would be an effective capitulation for the Left. It would take time and patience to recover from such a setback. The second scenario is that No wins and the creditors return to the table. This option is less likely than it was in February or even in May. And here there is a seeming paradox on the part of the creditors. Grexit (a Greek exit from the eurozone) and default remain not only immediately harmful to the markets but would constitute at least €160 billion in losses to Germany and France alone and could, moreover, jeopardize the foundations of the eurozone, on which the growth model of the European core continues to be based. It wouldn’t be the easiest decision for the creditors to kick Greece out if a “no” vote occurs. And given that the Syriza leadership itself has shown it still wants to avoid that scenario, the two sides may very well end up finding common ground. The question is whether that ground would include more favorable terms for Greece. I don’t think it would. The difference between February and today is that the Syriza leadership has exposed itself as almost intentionally unprepared for Grexit, insisting that it is not seeking a break with entrenched interests. The creditors, smelling blood, might determine that it is possible to make such an example out of Greece, that no other members would dare exit given the consequences Greece would suffer in the immediate aftermath. Already Spain’s Podemos and Ireland’s Sinn Fein are turning right. The result would be temporarily destabilized markets but ultimately a preserved monetary union. The situation has reached the point where this scenario might seem more palatable to the creditors than conceding even slightly to the demands of No. Of course, the Europeans probably would prefer a less confrontational route if they can get one. In a third possible scenario, then, No wins and the creditors resume negotiations — but on the condition that Syriza invites other political parties to join the governing coalition. A government of national salvation, without the drama of elections. This scenario would most likely see Tsipras yield power to some other figure within the party willing to preside over an effectively technocratic regime. There are several who probably would. The Europeans would save face, though most likely such a regime would not last for long. Instability would ensue, but of a more managed variety, at least for the creditors. 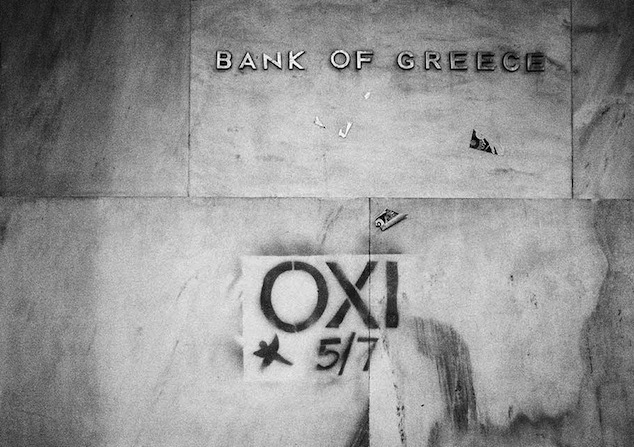 A fourth scenario sees rupture, but of the less favorable sort: No wins, either the European Central Bank pulls the plug on emergency liquidity assistance or Greece immediately leaves the monetary union, and the Syriza leadership proves wholly unprepared: having limited foreign reserves, it takes far too long to print new notes, and when it does, the currency is massively devalued. Granted, certain basic needs, including oil and medicine, have been guaranteed for the next few months. But the chief concern is liquidity. We can expect the government to try to tackle that with various interim measures, but it will be tough. Public coffers would be strapped for cash, pensions and wages could be stalled, and an already fatigued public could very soon lose its patience. From this perspective, the third scenario is much more appetizing to the leadership, and this fourth specter of mayhem could be used to discipline the rest of the party. The final scenario is Plan B with an actual plan. It is in some ways the riskiest but, given the other options, remains the most promising for Greek development and justice. Here, No wins, Greece exits, be it negotiated or unilateral, and there is a massive push to the left: nationalization of key sectors, notably the banking sector; the possible introduction of a parallel currency; restricted foreign exchange; imports of basic goods from allies; some kind of ration, however chaotic; a potential blockade of ports to begin disciplining Greek tankers, at the very least. This wouldn’t fully resolve the liquidity problem, but it would be better managed than in the fourth scenario — that is, not on labor’s back. Of course, this option means open confrontation with capital, to which key figures within the party have shown great apprehension. There will inevitably be a fight within the party, a rapid intensification of the simmering of the past few months that will also be influenced by forces outside Syriza. If those pushing for political radicalization win this battle, we must acknowledge that at that point, anything goes. It will be an actual break, with all the risks that entails. There could have been better preparation, and improvisation will be necessary. The question is whether the Left in which many Greeks have entrusted their vote is willing to take such a plunge into the unknown, into the alternative we said is possible. The answer to that will determine what comes after OXI. Five possible scenarios after today’s referendum in Greece.